Is Your Child in the Right Car Seat? | Larson Law Firm P.C. Car crashes are a leading cause of death for young children in the United States, but the Centers for Disease Control and Prevention (CDC) reports that many of these child fatalities could have been prevented. In 2016, there were 723 fatalities in children ages 12 and younger in motor vehicle crashes, and more than 128,000 injuries. Of those children who died in car accidents in 2016, 35% were not buckled up. In a CDC study, it was determined that 618,000 children ages 0-12 rode in vehicles without being restrained in a car seat or seat belt at least some of the time. Children must always be buckled in to a car seat, a booster seat, or a seat belt, depending on their age or size. Using a car seat reduces the risk of injury in a car crash by 71-82% for children when compared to seat belt use alone. Seat belts are designed to restrain adult bodies, not small children. The CDC says car seat use reduces the risk of serious injury by 45% for children aged 4-8 years, when compared to seat belt use alone. For older children and adults, using a seat belt can cut the risk of serious injury or death in a car crash in half. After they outgrow the rear-facing car seat up to age 5. When your child outgrows their rear-facing seat, he or she should be buckled into a forward-facing seat until reaching the maximum height and weight of the car seat. After outgrowing the forward-facing seat until they can fit in a seat belt. Once the child outgrows the forward-facing car seat, the next stage is to use a booster seat until he or she fits in the car’s seat belt. Once child has outgrown the booster seat. When a child no longer needs to be restrained in a booster seat, he or she should be restrained with a seat belt on every single car ride. The child should be at least 4 feet 9 inches tall and age 9-12. In our bitter cold North Dakota winters, we bundle up our little ones before venturing out of the house to keep them safe. What we need to stop doing, however, is buckling children in to their car seats while they’re wearing those bulky, “puffy” coats. SaferKids Worldwide reports that the child’s bulky coat will compress under the straps making the harness straps too loose, allowing the child to slip out of the car seat in the event of a crash. Instead, the group recommends that we slip off their coats, buckle them in, and cover them with a blanket, or put their coat on backwards. Using an insulated poncho in lieu of a coat, which can be slipped over the car seat or booster seat. Using a child-sized wearable blanket. These products usually have both sleeves and a way to button, zip or snap the bottom closed. There are websites like “Car Seats for the Littles” and “The Car Seat Lady” which offer different examples and options. Consumer Reports recommends using only aftermarket covers that have been tested and approved by car seat manufacturers. Where can I go to get help installing my child’s car seat? The North Dakota Department of Health conducts car seat checkup events where parents can get help safely installing their child’s car seat. 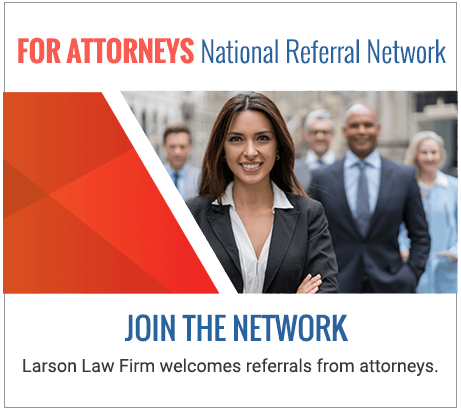 At Larson Law Firm P.C., our skilled North Dakota car crash injury lawyers are here to protect your right to recover compensation when you have suffered as the result of another person’s negligence. Please complete our contact form or call us at 701-484-HURT to schedule a free initial consultation today at our office in Minot.